Class description: Let’s explore all of the amazing fiber arts and choose which ones we like the best! “Exploring Fiber Arts” is a hands-on workshop for kids ages 6-12 to try out knitting, crocheting, and weaving, and to also learn about dyeing and spinning. Get your friends together and try it all out for yourself with instruction, resources, and materials provided by the teacher. This class is perfect for troops and groups (Girl Scouts, Boy Scouts, homeschooling groups, etc.). Extending the activities learned in this workshop on your own may even help you to earn a scout badge. Parents are welcome to attend at no extra cost if they prefer to stay with their child during the class. Supplies will be provided. Feel free to bring your own if you have something special that you would like to use. Teacher Maggie Broderick is a professional educator, fiber artist, and Girl Scout troop leader. In this 1 hour class, we’ll discuss different crochet stitches and techniques to enhance your knitting. We’ll talk about binding off with your hook, slip stitches for embellishing and joining, different stitches for edgings, and the provisional cast-on if time. 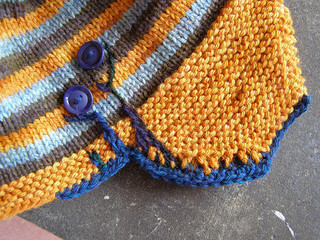 Bring worsted weight yarn, an H (5 mm) hook, and two stockinette swatches to join, or create the swatch detailed in the homework to practice some of the techniques we’ll discuss. Swatch instructions will be sent when you sign up for the class. Rebecca DeSensi has been crocheting and knitting for more than a decade. She works for a nationally-known, Pittsburgh-based, crochet designer and author, providing technical editing, pattern support, and sample creation for books, magazines, DVD workshops, and TV shows. She also has worked independently as a technical editor for publications and as a designer for a large national yarn company. She’s tried every technique and stitch out there, so it was a natural progression to jump into the business side of yarn. With her friend Karen, they dye and sell yarn as Amelia and Wiggles. Their booth can be found in the marketplace.